Is it hard for you to get a healthy breakfast in before you jet out the door? Or maybe you need a mid-morning snack to take with you? 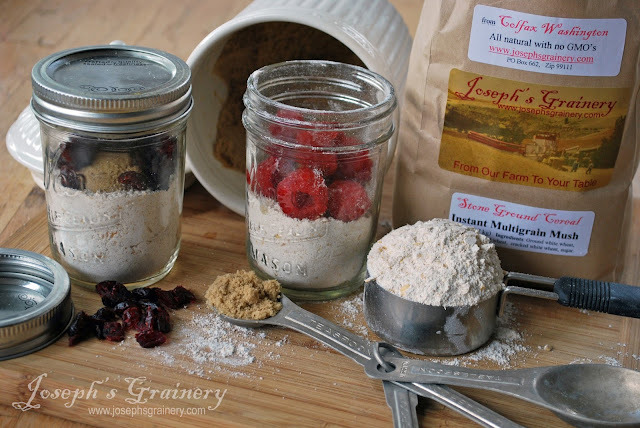 Pairing Joseph's Grainery Instant Multigrain Mush with a canning jar and some dried or fresh fruit makes the perfect breakfast-on-the-go! You can assemble a week's worth of on-the-go breakfast or snacks in a matter of minutes. Here's a simple and easy recipe for when you need that grab-n-go breakfast. A hearty, whole grain breakfast for on-the-go. In the half pint jar, place a heaping 1/3 cup of Instant Multigrain Mush, brown sugar and any dried or fresh fruit you desire. Add boiling water to reach your desired consistency and stir. Let sit for 5 minutes or so and then enjoy! fresh fruits - raspberries, bananas, strawberries, blueberries, etc.